There have been many books and films about comical curmudgeons who view the world with an angsty weariness that requires delving into flashbacks in order to understand. Movies like A Man Called Ove, Up, and St. Vincent come to mind, though there are plenty of other examples. 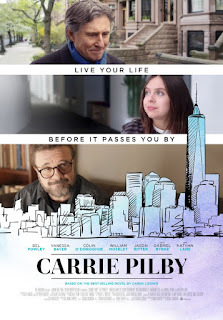 The idea for Carrie Pilby was to transplant that character archetype into the body of teenage girl. It’s based on the novel of the same name by Caren Lissner, and while it may appeal to the young adult audience it’s intended for, it’s a surprisingly flat film that wastes the talent of Bel Powley. She plays the title character, Carrie Pilby, a neurotic, Woody Allen type, who speaks quickly, loves to quote her favorite authors and thinks herself above the majority of the world’s population. She started college at a young age and now finds herself attempting to adjust to adult life while still in her teens. She clearly still has some angst towards her father, who took a very hands off approach to raising her after her mother passed away. And she grew up feeling disconnected to the world around her due to her unusually high intelligence that earned her entrance to Harvard before she was socially mature enough to handle college life. And much like Powley’s breakout film, The Diary of a Teenage Girl, Carrie had entered into an age-inappropriate relationship with a teacher who eventually left her heartbroken. Because of this shared plotline, the film occasionally comes across as a far less impactful retread. It also feels very mechanical from very early on. The opening scene places Carrie in an office with a therapist to establish everything we need to know about her. Though rather than doing it in unique ways through body language, clothing, framing and other such “show don’t tell” techniques, screenwriter Kara Holden and first time director Susan Johnson sit her in a chair and have her say her backstory outloud to a therapist who likely knows her story all too well already. It comes across as a, “for those just joining us” speech that feels very unnatural. Nathan Lane plays her therapist, Dr. Petrov, as a man weary of dealing with so many troubled people, but patient and caring enough to never give up on them. That’s good for Carrie, as he tasks her with a series of goals to accomplish before the end of the year. The goals are pretty basic, but they’re effective in bringing her out of her directionless funk. However, Petrov’s meetings with her frequent on the stereotypical movie therapist session. At one point he remarks that the profession comes down to listening to a person’s problems and asking them, “how do you feel about that?” His tasks for Carrie range from indulging in a tasty treat she no longer allows herself to making a new friend and going on a date. Working on each of these tasks coincides with an opportunity to bond with a charming and attractive neighbor (William Moseley) that seems willing to throw himself at her despite her moody reactions to him. And like so many other films of this nature, she ignores him in favor of other, less savory characters for much of the runtime. However, I will say the one main scene Carrie spends with her neighbor is a pretty incredible long take that has them walking the illuminated nighttime streets of New York City. I’m a sucker for a good long take, and as expected, it highlights the performances by both Powley and Moseley. It’s the clear highlight in an otherwise disappointing film. Like a Woody Allen parody, everyone in this film is either an intellectual or a caricature of a human being meant to be mocked and ridiculed. These side caricatures serve the transparent narrative function of comic relief, but they barely resemble real people. Their presence might not stand out in other comedies, but they seem like a peculiar choice in this otherwise more subtle dramedy. However, the real problem with Carrie Pilby is that for a film about someone who doesn’t believe in the necessity of relationships to make a person happy, the film’s message ends up being that relationships can turn your life around and finally bring happiness. It’s also ironic that this film is being touted as having an almost exclusively female production team, but the main character is only able to find a sense of happiness based on her interactions with the men in her life. By now you’ve likely also noticed a pattern. 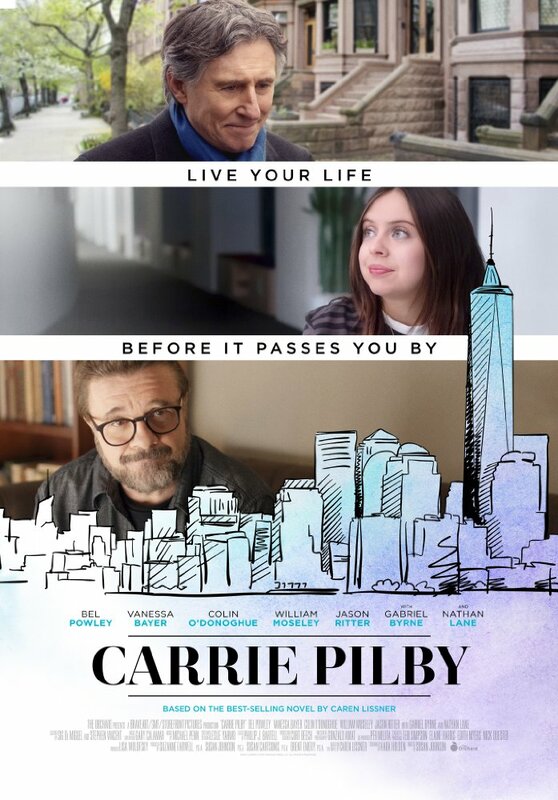 Carrie Pilby, despite Bel Powley’s best efforts is a shoddily written film based on stereotypical genre elements. The contrivances and lackluster dialogue only weaken a film I can’t help feeling as though I’ve seen already but done so much better.